The good news is, I know where it all went wrong. And whilst it looks very wrong, fortunately it tastes delicious. The problem was trying to change a raspberry ripple sponge cake into a swiss roll. And whilst I was so nervous about making a traditional fat free swiss roll, it wasn't that which was the problem. And so, one step removed, in my opinion, would a perfect swiss roll make. Heat the preserving sugar in a saucepan, with the lemon zest and juice until the sugar is dissolved and the mixture has thickened slightly. Add the the raspberries and heat for a further 3-5 minutes until thick. Remove from heat and leave to cool. Mix the cornflour and water together over a low heat. Add the mashed raspberries and stir over the heat for a couple of minutes. Remove from heat and add 100g of raspberries. Leave to cool. Set the oven to 200 degrees, line a baking tray. Mix the caster sugar and eggs. Combine the baking powder and flour, add to the mix gradually. Once fully mixed, add the vanilla essence, and combine. With a spatula, transfer 1/2 the mixture onto the baking tray and spread. Add the raspberry ripple mix. Pour the remaining sponge mix over and with a knife or skewer, run across the mixture to create a ripple effect. Stud the mix with the remaining raspberries. Remove from the oven when the sponge springs back. Sprinkle with some caster sugar and cover with a layer of baking parchment, tip out of baking tray and leave to cool for a couple of minutes. Roll into a swiss roll with paper still in place and leave to cool. Once cooled, remove the two sets of baking paper. Smooth over the cream, then the jam, and roll back into a swiss roll. 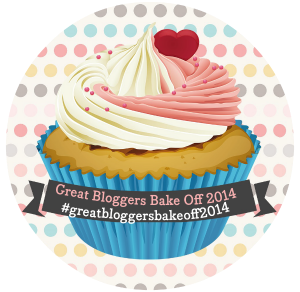 Of course, it goes without saying, this post has been inspired by the return to our screens of 'The Great British Bake Off'', and fortunately for you and I, Helen & Jenny are back with 'The Great Bloggers Bake Off' which means all you need to do is click on the badge below to get lots of inspiring, and slightly more successful, recipes! It looks delicious! These tasty homemade puds shouldn't look to perfect in my opinion. it looks lovely and once a slice was cut from it you would never have known that it came out of the tin a little messily. 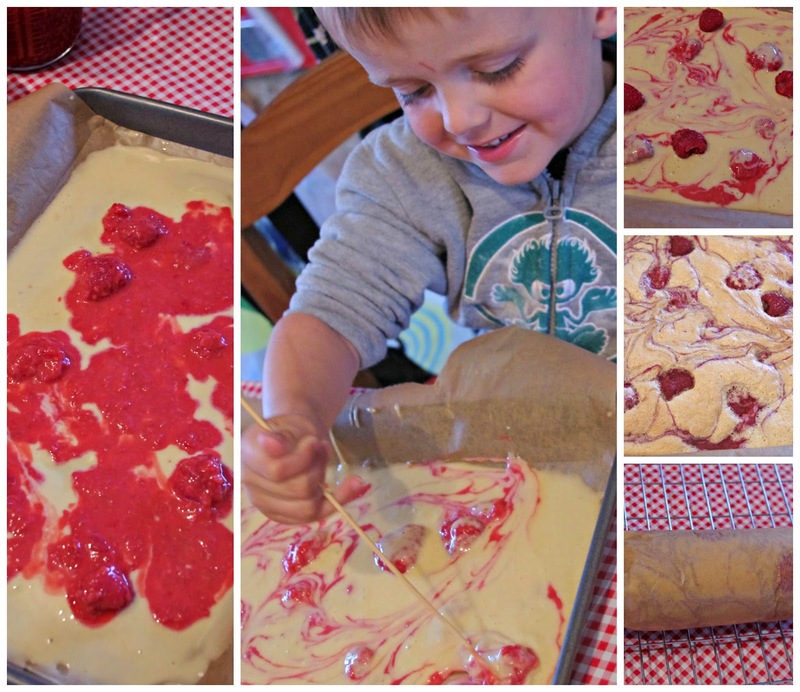 i love raspberry ripple and i also love that one of your boys was on hand to help.